Recognizes a 53 kDa protein, identified as the Ornithine Decarboxylase (ODC-1). 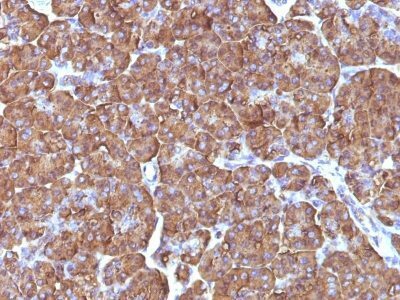 PC3 cells. Placenta, Prostate or Testicular carcinoma. Recognizes a 53 kDa protein, identified as the Ornithine Decarboxylase (ODC-1). ODC is the initial and rate-limiting enzyme in the biosynthetic pathway of polyamines and is involved in the conversion of ornithine to putrescine. The biological activity of ODC-1 is rapidly induced in response to virtually all agents known to promote cell proliferation including hormones, drugs, growth factors, mitogens, and tumor promoters. 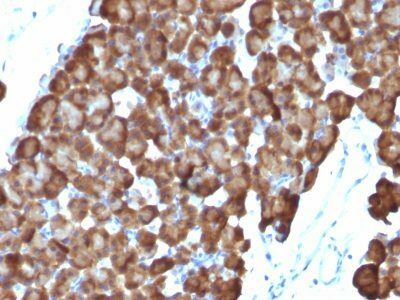 Reportedly, ODC mRNA levels are elevated in lung carcinomas as well as in colon adenomas and carcinomas. ODC activity in colorectal carcinomas is greater than those in adenomas and normal mucosa. Catalog number key for antibody number 0486, Anti-Ornithine Decarboxylase 1 (ODC1/486) The prefix indicates conjugation, followed by the antibody number and size suffix.